I enjoy writing dark, chilling stories with elements of black humour. The reason for this is that when you feel helpless or experience a dire situation where you see no resolution, humour is sometimes the light that guides you out of this darkness. With a busy family life and full-time job, I'm certainly not a prolific writer but choose to do so when an unusual thought or idea stokes my flame (and also when I can get some peace and quiet to write). Barrow of the Damned was one such unusual idea, which I thoroughly enjoyed writing, especially as I adore the fantasy and horror genres. Live Action Role-playing has a wonderful appeal; dressing up in costume, being in-character and living out your fantasies with similar minded people. It's pure escapism and I therefore wondered what would really happen if a group of adventurers faced real-life horrors in that situation. And, thus, Barrow of the Damned was written to test my theories, no matter how horrific or gruesome the outcomes might be. Barrow of the Damned is a young and new adult horror novel written by Jonathan J. Drake. Gavin, Dale, Katie and Jane were having a blast during the week-long extended role-play event hosted by Mr. Stephens at the Wardhope Centre, but the foam swords and rubber-tipped arrows seemed to nullify the authenticity of their experiences. To make matters worse, they had questions about the scoring of points that made them wish they had a games master involved to answer their questions. They all wondered about the special dungeon experience Mr. Stephens had promised that would be complete with a Games Master. It might just be the thing that redeemed a rather disappointing week. When they finally got word of the challenge, which was called Hoelbrad, or the Barrow of the Damned, they were intrigued and determined to give it their all. After they chose their costumes, Mr. Stephens explained that they would be fighting two orcs who would already be familiar with the terrain, and traps and snares were already set out for them. The Barrow was a good distance from Wardhope, entailing a hike through farm fields and onto the lands of Mr. Stephen’s neighbor, old Lady Hamilton. He assured them that they had her permission to enter the Barrow, which was located on her property. When they got there, the Barrow was defended by spiky bushes and brambles, and it seemed menacing and alluring all at once with its wooden pillars supporting the dark tunnel that lead within. This was real live role-play, and they would accept all challenges. 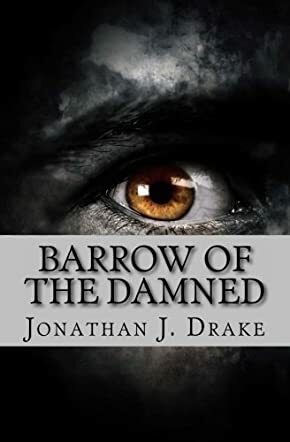 Jonathan J. Drake’s horror adventure novel for young and new adults, Barrow of the Damned, is an intriguing blend of role-play fantasy and Greek mythology as the four friends find themselves in a hellish and unreal struggle for survival. Drake’s Barrow is an ancient thing guarded by a stinking and generally loathsome being known as Bloater, who collects the heads of his victims and nails them outside his lair. I enjoyed seeing the parallels between the four friends’ efforts to navigate and escape the mazes, and the efforts of Theseus to escape the maze King Minos had designed to keep the Minotaur in check -- and Bloater makes a neat modern-day Minotaur. The presence of two of the three Fates also lends a strong mythological presence to the tale as well. The four role-players’ quest to survive their experience and regain their access to the world above is fascinating and filled with suspense, terror and the unexpected. I had a grand time reading this disquieting and thought-provoking gem of a horror story. Barrow of the Damned is most highly recommended. Barrow of the Damned is the latest addition to the horror genre by Jonathan J. Drake. Katie, Dale, and their friends are LARPers, live action role players, who have branched out from boards and consoles to the real world. Gathering at the Wardhope LARP Center, they are in for quite a surprise when their usual LARPing trip takes a sinister turn. Lured into a mysterious tunnel, they discover a vast network of tunnels that stretch for miles, much further than their usual stomping grounds. Thinking they have discovered the ultimate area for role playing, they soon learn that while they can get in, it is going to be much harder to get out ... alive. Barrow of the Damned by Jonathan J. Drake is a fast paced, action packed read full of thrills, chills, and dark humor, featuring an ensemble cast. Katie and her friends must use their wits if they are to survive the darkness lurking below. I enjoyed reading Barrow of the Damned, especially since I'm fan of horror. It has a classic edge that gives it more of a jeepers creepers vibe than anything more modern horror puts forth. Each character is distinct with their own quirks, and this serves the team and the plot well, adding some lighthearted fun to the dark moments. The plot is very straight forward as Drake sprinkles a liberal dose of the otherworldly into his text. He still manages to keep an undercurrent of mystery throughout as we try to discover what really lies below the surface, and who is the mastermind behind it all. Barrow of the Damned by Jonathan J. Drake is a competent tale that may keep more than a few readers up at night. Barrow of the Damned by Jonathan J. Drake is a blend of horror and adventure, a dark story that will give readers the creeps and goosebumps. Mr Stephens, a man whose soul is poisoned by darkness, owns the Wardhope Centre, a playground that features the ancient burial grounds, also known as the barrows. It is in the deep tunnels where the darkness resides that he sends his clients. Join the players and discover what lies underneath. Can anyone make it out of the barrows alive and unscathed? I wonder if you have had this kind of dream before, but I have had it many times. It is the kind of dream in which you are being chased by an ogre, a monster, or something that can swallow you whole, and then you feel as if your feet are glued to the ground. You can’t move, but you can feel the creature getting closer. This is the kind of feeling you get as you start reading this book. You’ll meet Vincent, unable to open the door, his energy sapped, while a creature lumbered close by. Jonathan J. Drake is a master at creating horror scenes that are haunting and nightmarish. The characters are very real and the action intense, evenly and wisely spread throughout the exciting plot. I also enjoyed the exquisite writing and the emotionally-charged prose. It is crisp. It is tight. And it conjures up the wildest, most sinister images that will haunt readers’ minds long after they are done reading the book. Barrow of the Damned has the drama, the action, the creeps, and everything in-between, but it also has the sinister thrill.